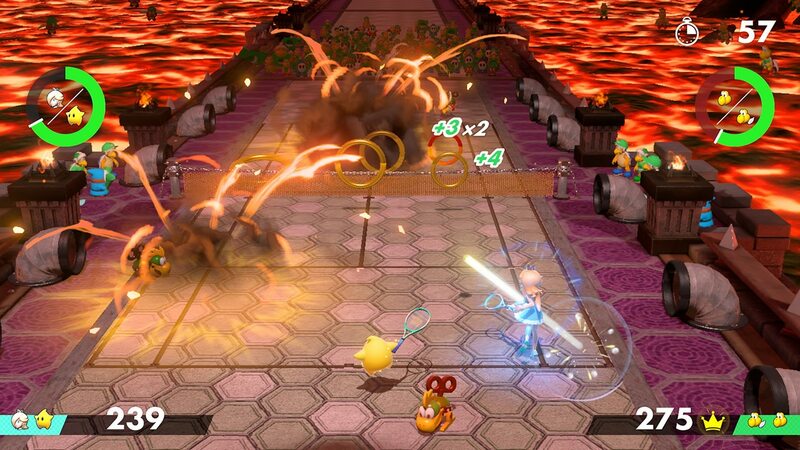 In this mode, you have to send the ball through rings while keeping the rally going with the other player(s). You get double points if you pass the ball through several rings at once, but also do so with a special shot. The key to this mode is to carefully manage your special gauge, and use special shots at the right time. 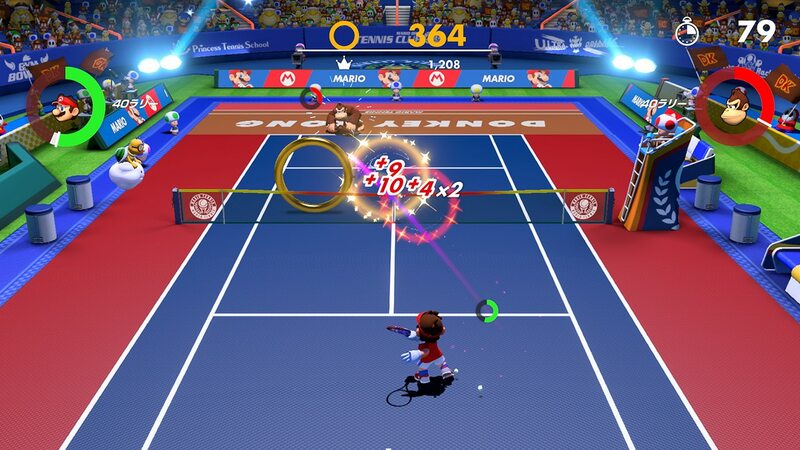 Ring Shot can be played on any court, even those with gimmicks, which means you can have both Ring Shot and gimmicks at the same time… a great way to spice things up! By the way, you can play with up to 4 players on the same console in this mode. Starting with Ver. 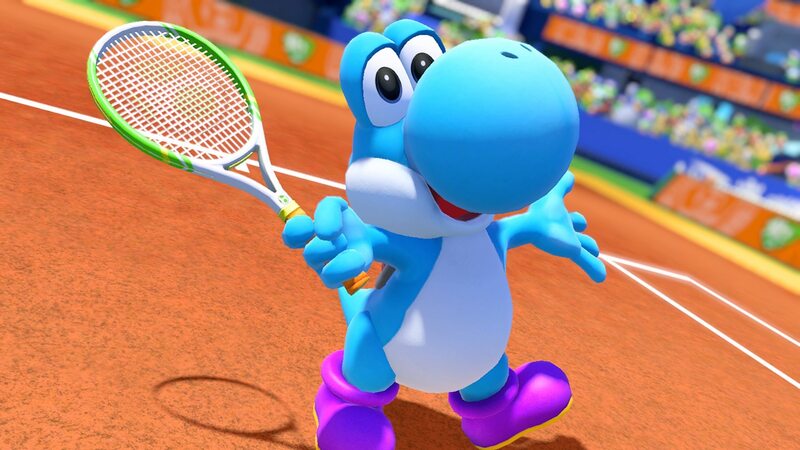 3.0.0 of Mario Tennis Aces, you will be able to play Yoshi’s Ring Shot, which is a variant of the Ring Shot mode with special rules. 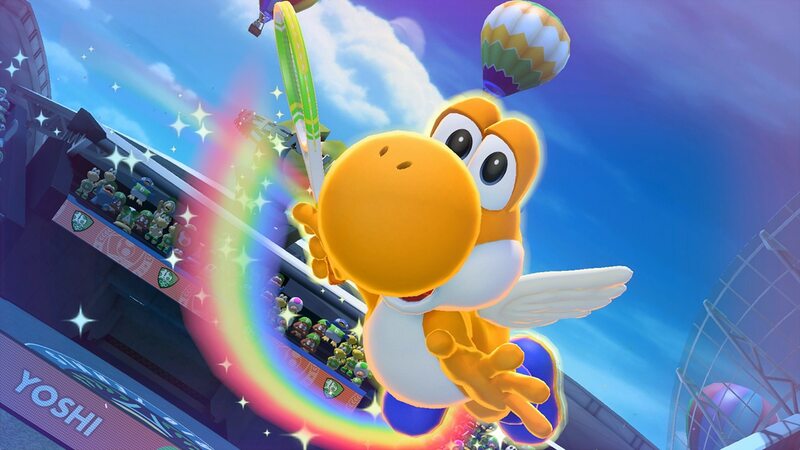 In this one, you get 4 times the normal amount of points if you send the ball through a ring of the same colour as the Yoshi you’re playing as. 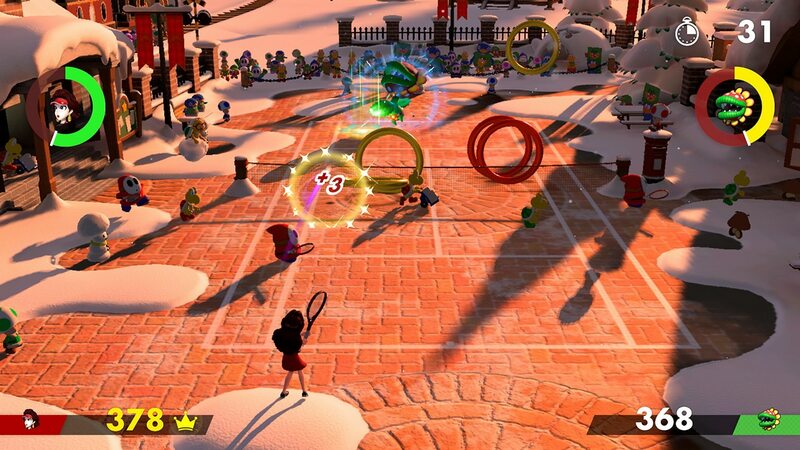 Just like with regular Ring Shot, you can play either in co-op or competitve mode. Of course, your strategy will not be the same for both: in co-op, you can leave rings of a certain colour for your teammate, but in competitive mode, it’s definitely not a bad idea to steal rings of the same colour as your opponent… who is most definitely going to try and do them with yours! Yoshi’s Ring Shot will also be available as Co-op Mission until une 1st. 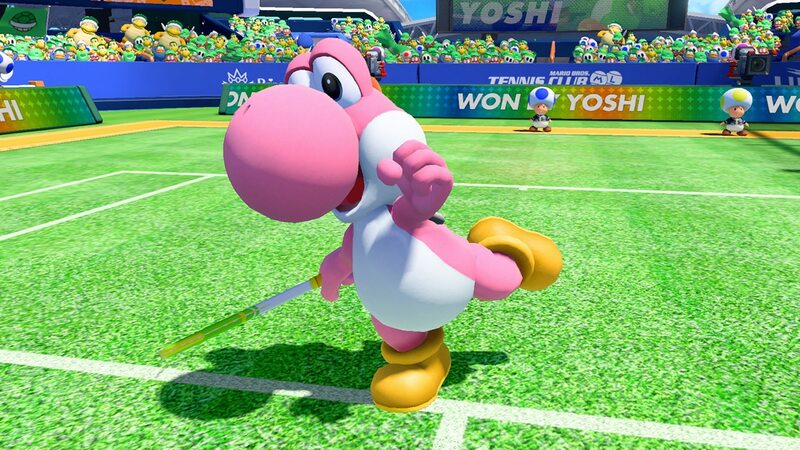 Depending on your performance, you will be able to unlock some special Yoshi colours! 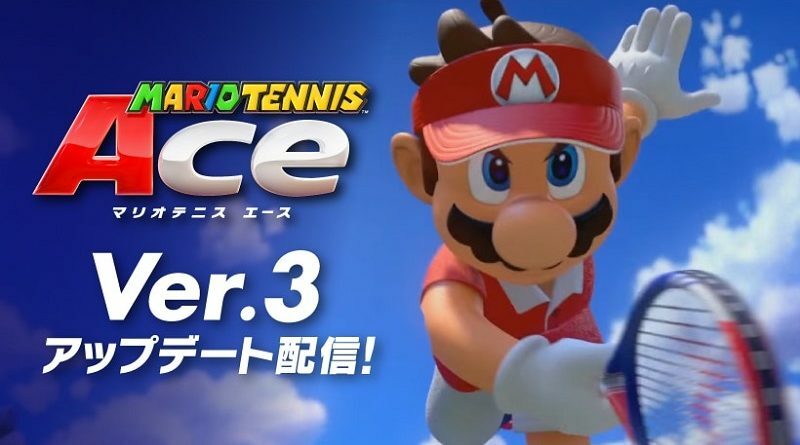 This update for Mario Tennis Aces adds a new opening movie to Adventure Mode. Even players who have already completed it can see it from the menu! 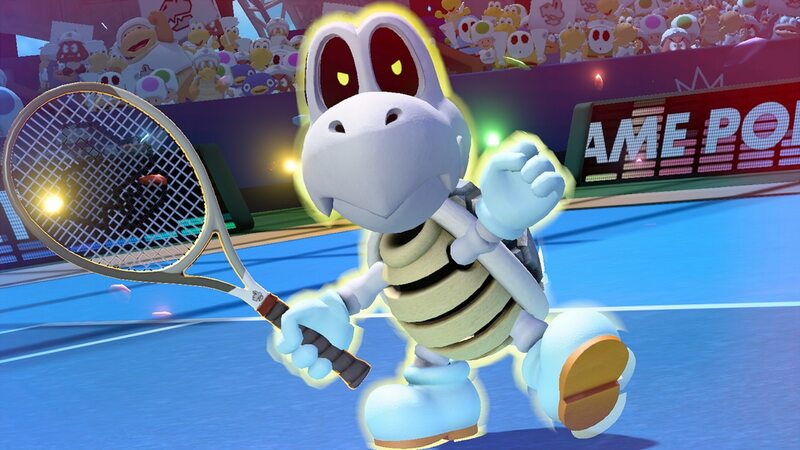 Finally, Nintendo confirm that the next additional character is Dry Bones, who will be added on May 1st for players taking part in the latest Online Tournament (and June 1st for everyone else). There’s now 28 playable characters, with at least one more coming (on June 1st)!